Southern Clinic: Olusina M. Akinduro, M.D. Dr. Akinduro received his medical degree from the University of Ibadan in Nigeria in 1984 and has been in practice for 30 years. He split his training between Nigeria in 1984, Scotland in 1990, England in 1992, and Columbia Presbyterian Hospital, New York, in 1994. 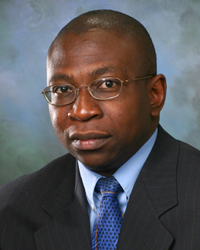 Dr. Akinduro is affiliated with SAMC and HealthSouth rehabilitation hospital as a board certified internist. Dr. Akinduro strives for quality and compassionate health care by setting high standards for patient service. Dr. Akinduro earned recognition by the American Board of Cardiology and the American Board of Cardiology Award of Excellence and Designation as Laureate of the American Board of Cardiology in 2014. He was included in the America’s Top Physicians in 2003, 2013, 2014, and 2015 by the Consumer Research Council of America. Dr. Akinduro received, entirely through merit, an Honorary Doctorate of Letters from the International Biographical Center of Cambridge, England, in October 2014. Dr. Akinduro was recognized as a Leader in Healthcare and a top doctor in the Doctors of Excellence Network in the 2013/2014 edition and 2015 edition. He was awarded Who’s Who in the 21st Century in the field of Medicine by International Biographical Center of Cambridge, England, in April 2001. He was also honored as a lifetime member of America’s Registry of Outstanding Professionals and Strathmore’s Who’s Who. Dr. Akinduro and his wife of twenty-seven years, Bolanle, are blessed with four children.